Steven Coffee II was born prematurely on September 28, 2012 to two excited new parents living in Hampton, Virginia. Initially, Steven had low glucose levels, high bilirubin levels, and threw up milk. Although the nervous, first-time parents were concerned, they were told it was not too alarming because Steven was born at 37 weeks and six days. What Lt. Col. Steven Coffee didn’t know was that his son was showing telltale signs that something was seriously wrong. Less than a month after Steven’s birth, a physician had reviewed the newborn screening and recognized the signs of a rare metabolic condition that was characterized by high bilirubin levels. She called the Coffees to inform them of Steven’s galactosemia diagnosis. However, the physician had a heavy Ghanaian accent and the Coffees had her on speaker phone, both creating communication barriers. “She said, ‘your son has galactosemia’,” Col. Coffee recalls thinking, “I don’t even know how to spell galactosemia let alone have heard about it”. The physician told them to go to another hospital and tell the doctors Steven has galactosemia. But, the physician failed to relay the risks and the severity of the metabolic condition, leaving the new parents confused about the disorder and the impact of this diagnosis. This miscommunicated diagnosis left them searching on Google for information on their son’s condition, and ultimately delayed the correct treatment for Steven’s diagnosis. Fast-forward to Thanksgiving night. Steven developed a swollen mass on his leg and upper thigh, which sent the Coffees to the emergency room. There, the mass was misdiagnosed as swollen lymph nodes, even though the condition continued to worsen, and the mass began to spread across Steven’s lower half. Unbeknownst to the Coffees or their physicians, the mass was the result of Steven’s distended stomach; had the condition been properly diagnosed then, perhaps Steven would have suffered less. Six days later, the Coffees were transported via helicopter to a larger hospital and sent to the Pediatric Intensive Care Unit (PICU). This was the first time they heard the severity of the diagnosis for their child. “The resident said, ‘this is Steven our two-month old from an outside hospital who has fulminant liver failure, secondary to galactosemia.’ My wife and I looked at each other and said what do you mean liver failure?” Col. Coffee recalls. Galactosemia is a rare metabolic condition that makes young Steven unable to break down galactose in milk due to the absence of an enzyme in his liver. Steven survived for two months, without treatment for his condition, before going into liver failure. After the excitement that came with having his first child, Col. Coffee became overwhelmed with emotions as they tried to figure out what was next for their child. During this time Col. Coffee describes his emotions as being “all over the map—it was quite the rollercoaster. I compartmentalized the anxiety, the pain, and the uneasiness and focused on the task to be done.” In short, he had to become comfortable with living in the midst of chaos. “Part of me was terrified, but the other part of me said ‘You’ve got to be strong for your wife because she’s scared’,” Col. Coffee remembers. He describes feeling helpless as he realized that he couldn’t do anything to protect his son, who was intubated in the ICU. 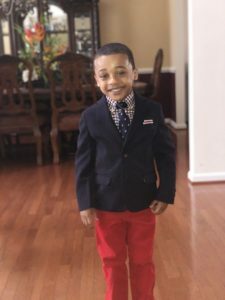 Since Steven’s transplant, the Coffees have found a conference that occurs biennially specifically for galactosemia families and Col. Coffee has connected with other families via various social media sites supporting the condition and liver transplantation. “It is a support network that we’ve created ourselves because both galactosemia and pediatric transplants are rare conditions,” Col. Coffee says. “As a member of military, we oftentimes are told ‘when you see something say something,’ but I didn’t know I could say something,” he explains. “I didn’t know I had a voice.” His core beliefs regarding misdiagnosis issues is that medical decisions involve shared decision-making between patients and providers. People need to slow down in order to receive the correct diagnosis, and patients need to know that they can speak up if they don’t understand something or have additional concerns. He wishes he had asked the doctor what it meant when the baby is jaundiced or what it meant when they said he has galactosemia. “What if we’d done more testing? What if the new born screening results of the test were interpreted universally across medicine? What if the doctors knew more about galactosemia? What if I had requested to have a full genetic sequence? Would they have caught his diagnosis of galactosemia earlier?” Col. Coffee asks himself. Since the transplant and his experience with delayed diagnosis, he and his wife have educated themselves on galactosemia and he has become an advocate for quality and safety in patient care. Col. Coffee is now a Patient Advocate and a member of the MedStar Georgetown University Hospital Patient Advisory Council for Quality and Safety. He hopes that patients will learn to relay their symptoms in complete detail, and that they will ask questions to their physicians to become partners in their care. Steven has gone through occupation, speech, and physical therapy to help him overcome the obstacles associated with his condition. He has made great strides in his recovery from the transplant, and he will be attending first grade in the fall of 2018. Col. Steven Coffee is a Patient Partner working with SIDM’s Patients Improving Research in Diagnosis (PAIRED) project, funded by the Patient-Centered Outcomes Research Institute (PCORI). Read his biography. To learn more about the project, contact Sue Sheridan at sue.sheridan@improvediagnosis.org.